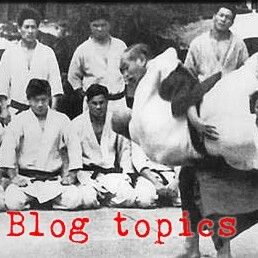 Links to previous articles on The Walk - - nanameashi, wakiashi, tenkanashi, shomen tegatana, and soto mawashi. 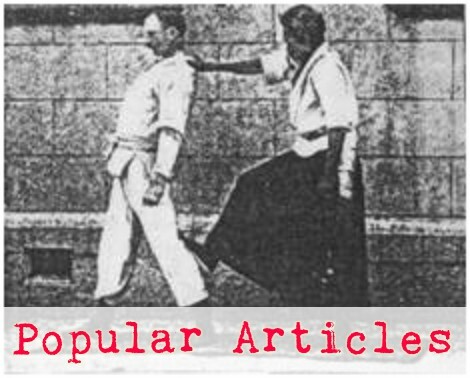 Q: How many Tomiki aikido folks does it take to do The Walk? A: Twenty - one to do the thing and 19 more to watch and say, "That's not how we do it at my dojo ;-)"
But anyway, today's discussion on The Walk is on the 6th movement - uchi mawashi, or as we call it, "The up-the-middle." The beginning of the motion is sweeping an unbendable arm upward along the centerline from hip-level (gedan) to above and in front of the head (jodan). We usually think about this as a flying wedge, or cowcatcher motion. This is the part that we call the "up-the-middle." Next, the arm comes offline to the side, drops, and turns over in a small circle. The drop of the arm is timed to coincide with the drop of the center. This can be interpreted as release #4 similar to Yon kata #9). Some people (as in the film above) de-emphasize or skip the cowcatcher motion in this exercise (they may get the cowcatcher elsewhere) and emphasize this as a dropping diagonal chop timed with the drop step. This is another good element to get in there. Notice that after any drop step, there is a recovery step, in which your feet come back together and your center rises. After the drop-chop, there should be a slight rising push so that your arm stays synched with your center. This and the previous movement (soto mawashi and uchi mawashi) are actually very similar to the two arm PNF patterns (to put this exercise in geek speak), and one of the interesting things about these two motions is that you can construct any arm motion from pieces of those two motions.